Autumn/Winter OOTD #3: "Hello Mr. Blue Sky"
No it was not a sunny day today. It was cold and dull. I decided to use the lyrics in the title because my outfit was very blue, and since it's winter now and the sky has gotten grey, I thought it'd be cool to use an 'out of the blue' (see what I did there?) title that's a complete lie. Also I love the song; such a brilliant beat! So here I am typing this blog-post on my laptop watching the Xtra Factor with wet hair on a Sunday night (I know this is published on a Monday, but I wrote it the night before) and I just had the most perfect bubble bath and pamper session which I will blog about next week or so... Today was good productive and relaxing day. Life's grand. School is fine, although I feel a tiny bit pressurized since exams are coming up, at least there not huge ones! I should chill. I am so excited about Christmas already. I even have a board dedicated to it on Pinterest. Oh dear. I'm going to quickly answer four questions from Twitter before I go and leave you. If you'd like to ask me a question (not too personal; ones like the Qs I'm about to show) then comment below or tweet me @queenofquirk. 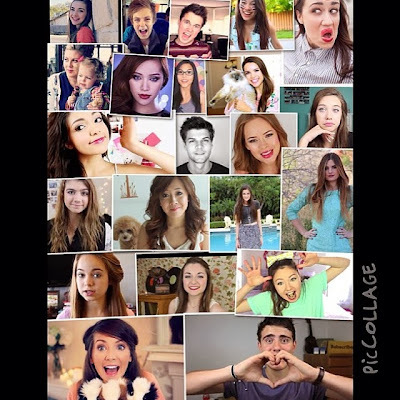 @Gaby_blogger: Favourite bloggers and youtubers? a bit if you'd like a look). My favourite youtuber of all time is MacBarbie07, but I also love Dontneedmakeup (you! ), daintysprinkles, thefashionchain, aliciahere11 and the youtubers below. Hollister, Penneys, Boots or Bershka. Can't decide! @prepandcotton: Who or what inspired you to start blogging? I'll chat to you all soon. I hope you are all healthy and happy and I wish you the best this November! Your hair is so gorgeous, I'm trying so hard to grow mine longer! You remind me so much of my younger self! I used to have a blue flower very similar to that and I had a blue graphic tee the exact same color that I would wear!